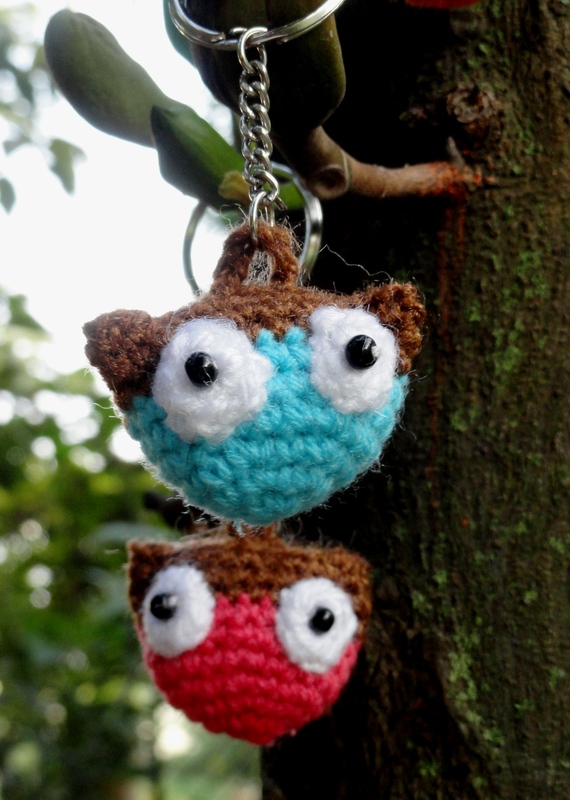 With their wise round eyes and the know-all look, the owls are a gem of a subject to be crafted. 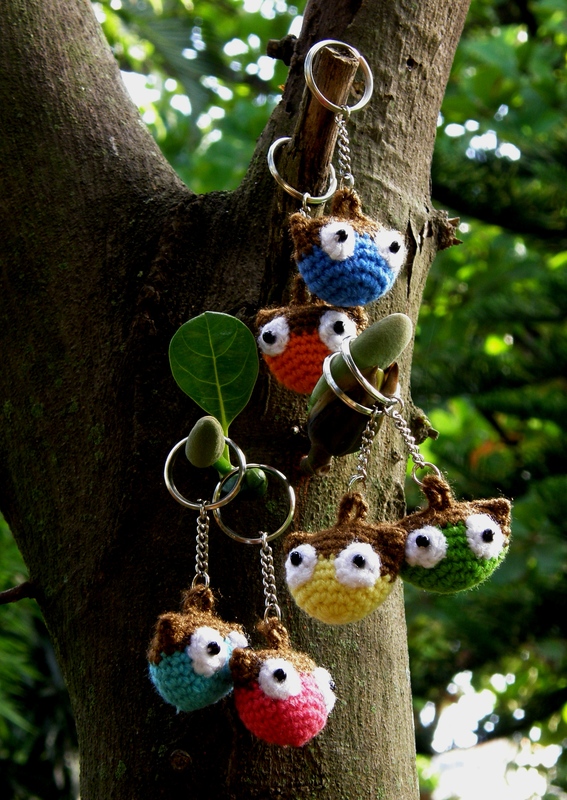 So when it was decided to make a bunch of key-rings with critters/fruits as a gift idea, I looked up and searched, but did not get a suitable owl to hang on to a key-ring, so I decided to create one of my own. 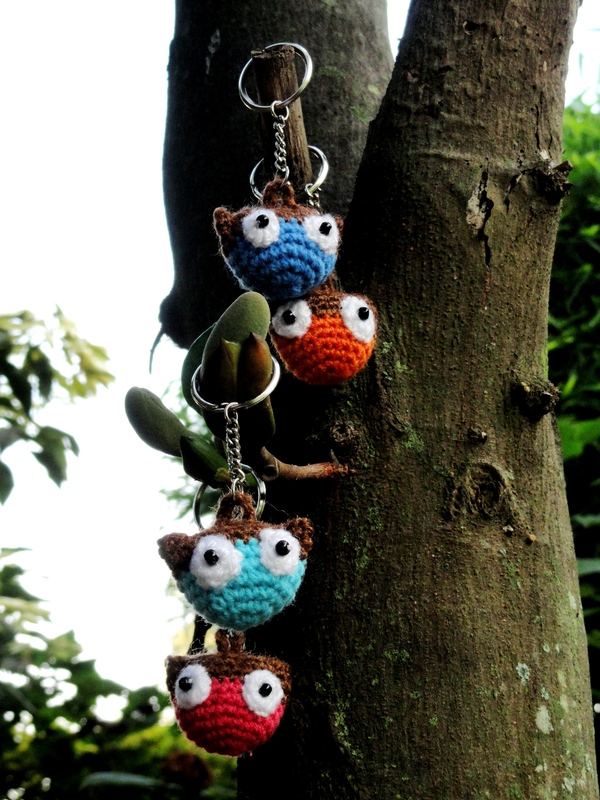 And so came the Hootie-rings. It should be good as a quick small gift idea. -So go as colourful as you want in selecting from your stash, but just keep some serious colour handy for the top, as all owls are very serious thinkers! I chose brown. -Small length of laceweight acrylic in white/ white sewing thread. -2.5 mm crochet hook. To get a tight and pore-less fabric, so that the innards do not show. – Fibrefill small quantity, to stuff it tight, to make them look healthy and well-fed. – Two black beads of appropriate size. (You can use safety eyes too). – A jump ring to attach the Hootie with the keyring. You will be working in continuous circles without joining at the end of the round. Please mark your first st of each round from Round 2 onwards with a St. Marker/ safety pin. Rnd 1 – Make 6 SCs in a magic ring. Tighten the loop. On the last SC of Rnd 6 when two loops are still on the hook, join in the brown/sober/serious colour. Cut off the brighter colour yarn keeping a 2” tail and tie a knot at the back with the brown yarn. The knot will ensure that ends do not slip out and it can not be seen once the body is stuffed with fibrefill. 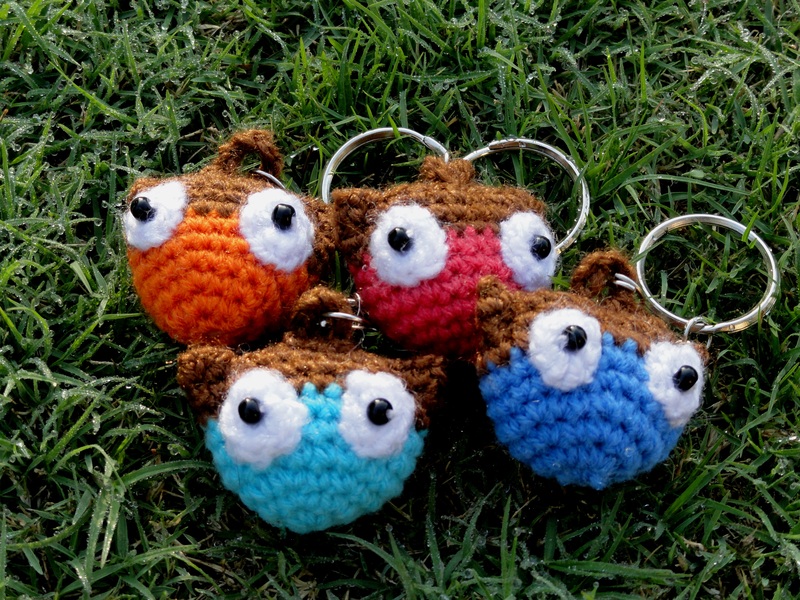 For changing colour in crochet the following tutorials may be helpful. Rnd 9 – SC in first 6 stitches, ch 7, SC in rest of the 18 stitches. ( the Ch 7 will become the ring, which will be attached to the key-ring). FO keeping a long tail for sewing. With white DK acrylic yarn and 2.5 mm crochet hook. Rnd 1 – Make 7 SCs in a magic ring. Tighten the loop. Sl st into the first SC. FO with a short tail. Weave in the ends with the help of darning needle, so that you get two flat disc-lets. Flatten the body with your fingers in a way so that you have the yarn tail left for joining, at right top corner. Place one of the eye discs covering the 2nd to 4th sitcht from right, in a way that the central line of the disc gets aligned with the line of change of colour in the body. Basically the eye is to be placed half on the coloured part and half on the brown part of the body. With the darning needle and the white lace-weight/sewing thread, fix/position the disc to the body with a small stitch. Attach the black bead at the centre of the white disc. Now fix the edge of the disc to the body with small invisible stitches around. Repeat the same with the left eye, placing the disc covering the 2nd to 4th sitcht from the left. Fill the body with fibrefill tightly. Start joining the top with the long tail left for the purpose. Stitch the corner in a triangle a couple of times using small running sts to create the right ear. Join across the top of the head ensuring the 7 Ch ring remains outside. At the end repeat the process as done for the right ear to create the left ear. Look at the Hootie giving you the wise look!! Attach Hootie with a jump ring to the key-ring through the 7 ch loop. He’s going to ensure you keys are safe!! !